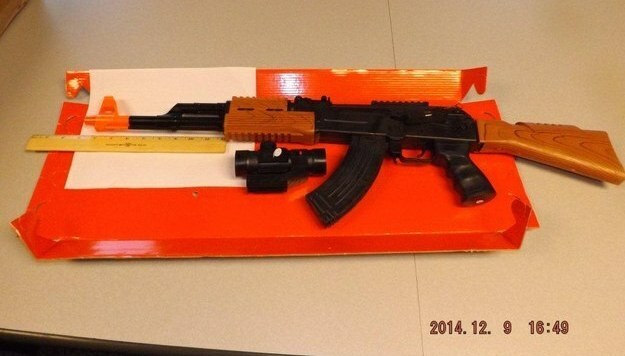 A prohibited toy gun from Amazon, via the NY AG’s office. New York Attorney General Eric Schneiderman’s office says several retailers are selling illegal toy guns online, as the items don’t carry an orange stripe required to mark them as fakes and not real weapons. His office annoucned today that it issued cease and desist letters to retailers including Amazon, Walmart, Kmart, Sears and more, demanding they stop the alleged illegal sales. Those retailers allegedly sold prohibited toy guns online to residents of New York State, with at least one case of a sale at a Kmart store in Rochester. The letter calls for retailers to immediately stop selling the toys online and in-stores, pending the final outcome of the AG office’s investigation. According to the investigation thus far, officials say many of the prohibited toy guns, priced from less than $10 up to several hundred, can be found and purchased easily online in New York. Some of those were advertised as “realistic looking” and “full size,” so without those orange stripes on both sides of the barrel, the AG says the fake assault rifles, shotguns and pistols could easily be mistaken for real weapons by not only fellow civilians, but law enforcement as well. The safety of our customers is a top priority. We are in the process of immediately removing any non-compliant toy guns that are offered for sale by Sears or Kmart to New York consumers. We will fully cooperate with the New York Attorney General in its investigation.